This mousse gets its fluff from an unexpected ingredient—the liquid reserved from canned chickpeas, called aquafaba. 1.Drain the chickpeas, reserving the liquid. Set chickpeas aside for another use. 2.Measure 2/3 cup of the aquafaba and place it in the bowl of a stand mixer fitted with the whisk attachment. Add sugar and cream of tartar. Whip mixture on low speed for 1 minute, slowly increasing speed to high. Whip approximately 10 minutes, or until it forms medium peaks. 3.Meanwhile, place dark chocolate in a microwave-safe bowl and microwave at 50% power, 30 seconds at a time, stirring after each increment, until chocolate is melted. 4.Carefully fold the melted chocolate into the whipped aquafaba. 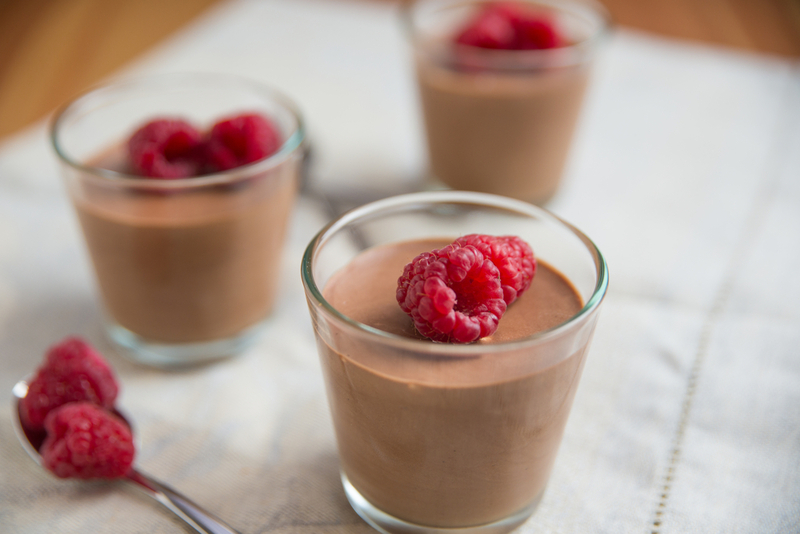 Pour into individual ramekins and refrigerate until solid, about 30 to 60 minutes. 5. Top with grated chocolate, raspberries, strawberries, or fruit of choice.